Here is your motivational quote of the day: “open your mind, and discovery will follow”. If you are wondering what the heck is wrong with this Talkavino guy starting the wine post with motivational quote, read on, I will explain. Today we will be talking about the wines of New Zealand. What is the first wine which comes to mind when you think “New Zealand”? Don’t know about you, but for me it is a Sauvignon Blanc. Closely followed by Pinot Noir. But then there is beautiful Chardonnay, and Bordeaux blends, and Riesling – please, don’t forget the Riesling! Two weeks ago I attended the New Zealand wine tasting event in New York. The event consisted of the seminar and the tasting, so below you will find my notes from both. But before I will inundate you with the wines and the tasting notes, let me share some general thoughts. New Zealand wine industry is relatively young. First Sauvignon Blanc was planted in 1973, and first commercial release took place in 1979. [However, the first vines were planted in New Zealand in 1819, and in 1881 Pinot Noir from Central Otago got gold medal in the “Burgundy” category at the wine show in Sydney – but let’s leave it aside for now]. Through the 1980s, Cloudy Bay found its magic, and New Zealand wines spread out throughout the world (definitely in US). The New Zealand wine export had been growing steadily for many years, from 30M gallons of wine in 2009 to the 44M gallons in 2013, also reaching almost US $1B in revenues in 2013. Also, a lot of New Zealand wineries utilize sustainable winemaking methods and use organic grapes (you can read more here). 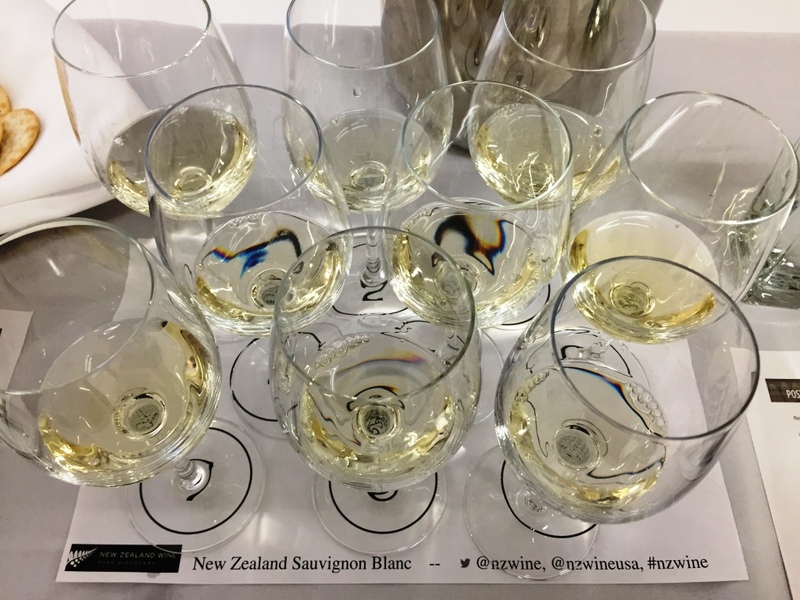 What I also sense from reading the blogs and listening to the experts is that the New Zealand winemakers are feeling constrained by what they already achieved and are trying to break the boundaries. Few simple facts for you. There are 11 defined wine regions in New Zealand. However, many winemakers believe that this is not enough, and want to define the sub-regions with much smaller boundaries. Such sub-regions are not yet official [I might stand corrected here – according to the New Zealand wine web site, the sub-regions are defined, but I still don’t know how widespread or how official those designations are], but on many labels you can already see designations for the sub-regions, such as Awatere or Waihopai in Marlborough, or Pisa in Central Otago. Different soils, different micro-climates, different terroirs, if you will – all lead to production of stylistically different wines coming from the different areas of the same bigger region. There is more to this “breaking the boundaries”. New Zealand wine is not only a Sauvignon Blanc and Pinot Noir. There are Syrah, Merlot, Pinot Gris, Chardonnay and even Grüner Veltliner and Chenin Blanc wines which are shining. And even familiar Sauvignon Blanc is taking to the totally new territories, by using oak and not only – which leads us to the seminar, so we can finally talk wines. The seminar was very interesting. It was done in the unusual format. There was no classroom with a head table and presenters. There was a big roundtable (well, it was actually a square), with presenters and winemakers sitting around the room among the participants. But this was not the most unique characteristic of the event. There were 9 Sauvignon Blanc wines presented in the event. And all 9 were … oaked. With the various degree, but yes, all Sauvignon Blanc wines went through some oak ageing process. There was also a 7 years old Sauvignon Blanc wine, which was quite unique for me. All in all, it was very different and interesting. Was it successful? I will defer you to my notes below. Here we go. N: fresh cut grass, very restrained, lemon notes, minerality, touch of sapidity, interesting complexity. N: concentrated green notes, more of a fresh vegetables greens in the garden than grass. Touch of sweetness after swirling the glass. P: very restrained, complex, salinity, white stone fruit, acidity on the finish. N: hint of gasoline – disappeared after intense swirling. Touch of white fruit, restrained. Hint of lemon. Overall, nose is not very pronounced. N: non-typical. But may be a distant hint of grass. P: lemon, fresh, supple, good acidity, nice textural presence. Still, tremendous amount of acidity is coming through, plus tannins in the finish! P: great complexity, restrained, guava, lemon, minerality, grass, touch of tannins, but it is well integrated. N: butter, vanilla, butterscotch- wow, is this is a Chard? Pronounced, concentrated flavors! V: it gets 8 (or even 8+) as a Chardonnay and 6 as Sauvignon Blanc. I would be glad to drink this wine – just don’t tell me what it is. N: very inexpressive. Whatever I think I smell, is a product of my imagination. After 5 minutes of swirling, grass showed up, more of a typical expected SB. Still Very restrained. N: some vegetative notes and fresh salami (yes, you can unfollow me if you want). Some distant resemblance of fruit. On a second thought, it has a Chablis-like minerality. The sausage is off, Chablis is in. P: most elegant palate in the tasting. Acidity definitely wore off, but the wine is elegant, complex, mellow, just an interesting wine in the style of nicely aged white Rhône. V: best of the tasting. Very round and elegant. Drinkability: 8. And then there was a tasting. I didn’t get an opportunity to taste all the wines. Also, as you would expect, I liked some wines more than the others. Thus below are the wines which I liked the most from what I tasted. Oh wait, I still have to explain myself with that “open your mind” intro. Let me do it now, the story is rather simple. What flavors do you typically associate with the Sauvignon Blanc? Grass? Check. Lemon? Check. Grapefruit? Check. Gooseberry? As Chris Kassel mentioned recently, most of the people who didn’t live in Europe have no idea how Gooseberry smells or tastes, but okay. Check. Some white tropical fruit? Possible and Check. But what about Black Currant? I don’t know about you, but I don’t associate red or black berry aromas with Sauvignon Blanc. But – black currant is one of the main characteristic aromas of Cabernet Sauvignon. And Sauvignon Blanc is a parent of Cabernet Sauvignon. Thus when I heard from one of the hosts talking about the wine “beautiful black currant aroma”, that was a nail on the head! Yes – exactly – the revelation – forget the damn Gooseberry, just open your mind (talking to myself) and understand that black fruit can be associated with white wine (I’m sure the opposite is true). I would honestly say this was my main discovery of the tasting, the revelation. 2012 Astrolabe Province Pinot Noir Marlborough ($28) – +++1/2, excellent!! Best of tatsing? 2011 Domaine-Thomson Surveyor Thomson Single Vineyard Pinot Noir Lowburn, Otago ($44) – +++, excellent! 2014 Lake Chalis Sauvignon Blanc Marlborough ($18) – +++, perfect, black currant, beautiful! And we are done here. What do you think of New Zealand wines? What are your favorites? Did you ever associated Sauvignon Blanc aromas with black currant? Until the next time – cheers! Life is an interesting thing (wow, what a deep opening thought, huh?). I was supposed to depart at 6 am on a direct flight from New York to Miami to attend the conference. Thanks to much-hyphed-but-never-really-happened blizzard, my flight was cancelled and I was automatically re-booked, now on the flight with the stop, connecting through Charlotte, North Carolina. Charlotte. You know, there are some strong emotional words which I’m striving to avoid, whether conversing or writing. One of such words is “hate” – and I will explain the connection in a second. 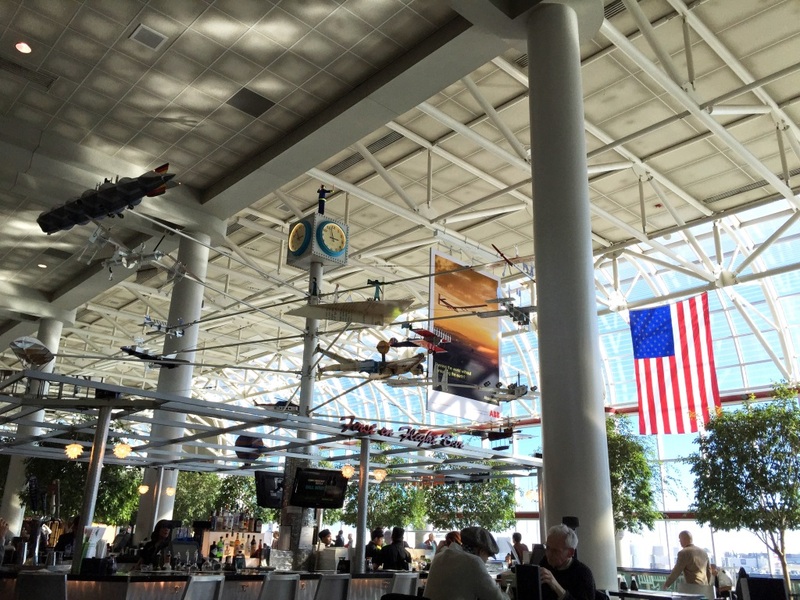 I travel a lot, and I have interesting memories of the different airports and trips, some better and some worse. But – if there is an airport which I “hate”, that would be the Charlotte. The reason is simple – lots of memories of severely delayed flights, cancelled flights, indifferent customer service and even sleeping on the floor as no other options were available. Yes, I know – it is actually stupid to “hate” airport – but I wanted to explain my feelings when I saw that I’m connecting through the Charlotte. Okay, so I have no choice (called my travel agent multiple times – no way no how, either I take the flight as it is, or just cancel the trip). Short uneventful ride to the La Guardia airport and I’m at the terminal C. It is probably been a few years since I used that terminal, so once I get through security and walking to the gate, and I’m literally saying “wow”. The terminal looks very modern, screens and everything. I stumble upon a cafe which has lots of seats, with an iPad standing in front of every seat. iPad can be used for ordering or just some limited internet browsing. The cafe features a very attractive looking menu with lots of food options, mostly written in French, the language of “love of sophisticated food”. And the wine list looks quite reasonable, both in terms of international selection and price. Yes, definitely not something I was expecting to find. Anyway, it was kind of early for wine and I was not hungry, so this was mostly a “note to self” for next time I might be using the same airport. To my surprise, the flight departed on time (almost a miracle for the La Guardia airport), and arrived in Charlotte ahead of scheduled time. Many times in the past while flying through the Charlotte I stumbled upon a little wine shop, more of a tasting room for the Yadkin Valley wines. My schedule never allowed me to actually visit it. Then I remember being at the Charlotte airport at the reasonable time, only to find that the store was gone. 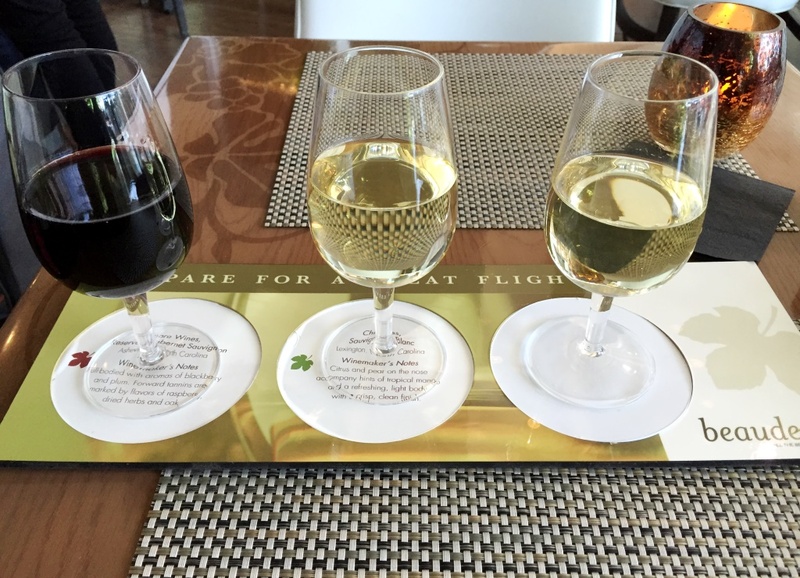 This time as I knew that I will be connecting through the Charlotte, I decided just in case to check if there are any of my favorite Vino Volo restaurants at the airport. Nope, there were none, but I found a wine bar called Beaudevin, with a number of raving reviews, including the mention in the very reputable Fodor’s travel guide as one of the 8 top wine destinations in the airports in the US. So the early arrival gave me enough time to stop by Beaudevin, which is conveniently located right in the middle of the terminal, in the section called Atrium. It appears that Beaudevin uses a similar model to the Vino Volo, offering wines both by the glass and as part of the tasting flights. To my delight, one of the featured flights consisted of North Carolina wines, and of course, this is what I went for. Somehow it was stuck in my head that I recently read some rather negative reviews of North Carolina wines, so I approached these wines with a bit of trepidation. But – call it luck, fruit day or anything else, but I was rather blessed with a wonderful treat. And now, let’s talk about the spectacular pairing. Beaudevin offers essentially a full restaurant menu – if you have a long connection, you can spend quite an enjoyable time there. As my time was limited, I decided on a Charcuterie salad (lettuce, prosciutto, dried cranberries, green beans, dried cheese), with the addition of smoked salmon. 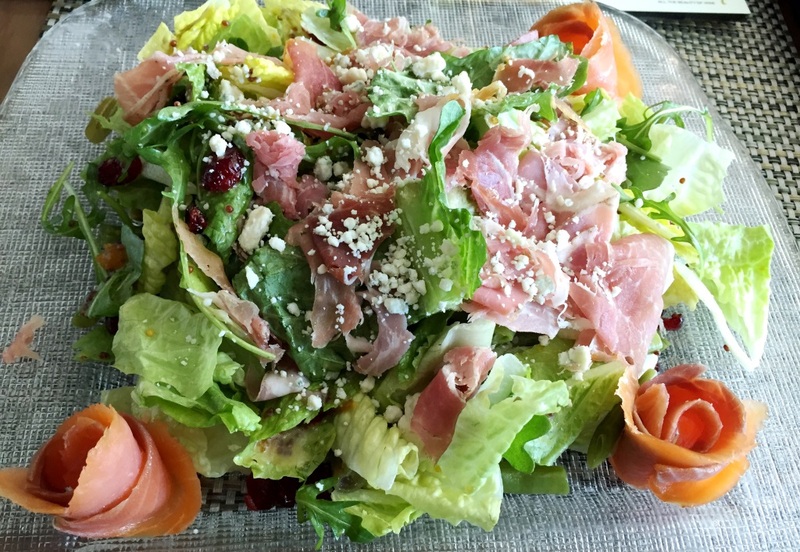 When it comes to the salad in general, I never even attempt to pair it with the wine – I believe generally it is not an easy undertaking. In my case here, I finished my “tasting” and “note taking” session, and I had the wine left, so I really had nothing to lose. I started from Viognier, and “wow” – the wine greatly complemented the sweet profile of the dried cranberries and dressing, so together it was almost a revelation. Next bite and sip, this time of Sauvignon Blanc – and yet another revelation – this time with the clean acidity cutting through the sweetness, contrasting and enhancing flavor. Last but not least, Cabernet Sauvignon perfectly complemented saltiness of the prosciutto and even smoked salmon – totally unexpected, but considering the soft and delicate profile of the wine, it was again a home run. Three wines out of three, working perfectly with one dish (salad!) – this was definitely not something I was expecting, but I’m glad I was able to experience it. Life is an interesting thing. Cancelled flight led to the very pleasant and educational experience – life can take one thing away from us, and give us something else instead – for sure my case with this trip. Also, it is very interesting to see how the wine culture is changing in the US. From unfathomable plonk only 3–4 years ago (I would never think of ordering wine at the airport 4 years ago – beer would be my only choice), to the upscale wines and wine flights – we are definitely looking at the cultural shift, and I don’t know about you, but I’m very happy to see this happening. Heck, I might even start looking forward to my next trip through the Charlotte airport. Cheers! We are continuing our white grapes explorations with this new wine quiz. In the spotlight – Sauvignon Blanc. Sauvignon Blanc is definitely one of the major white grapes in the world. Literally every wine-producing country is making wines out of the Sauvignon Blanc – France, New Zealand, Chile, California, Italy and many others produce wine in variety of style – from unoaked, light, perfectly summery wines to the barrel-aged, round wines with lots of substance and going all the way to some of the best in the world dessert wines. Sauvignon Blanc originated in Bordeaux, and spread out around the world in the 19th and mostly in the 20th century. The interesting fact is that while Sauvignon Blanc universally retains its acidity and some fresh cut grass notes, the resulting wines are definitely unique based on the region where the wine is made. French Sauvignon Blanc boast fresh cut grass and acidity, both Chile and New Zealand have lemon/lime/grapefruit as cornerstone of their flavor profile. Sauvignon Blanc wines in US typically show those fresh cut grass notes, but have a lot more fruit all around. Italy at the same time is taking Sauvignon Blanc to the totally new level of expression which have to be experienced. All in all, Sauvignon Blanc produces wines worthy every bit of attention. Q2: Name [probably] the most famous wine in the world which contains Sauvignon Blanc as part of the blend. 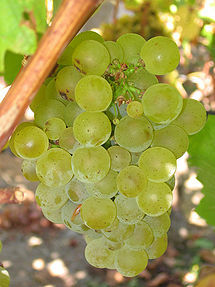 Q4: One person played a crucial role in making Sauvignon Blanc one of the major California white wines. Can you name that person? Q5: Below is the list of great Sauvignon Blanc wines and equally great producers. Do you know which producer made which wine? Good luck, have a great weekend and cheers! 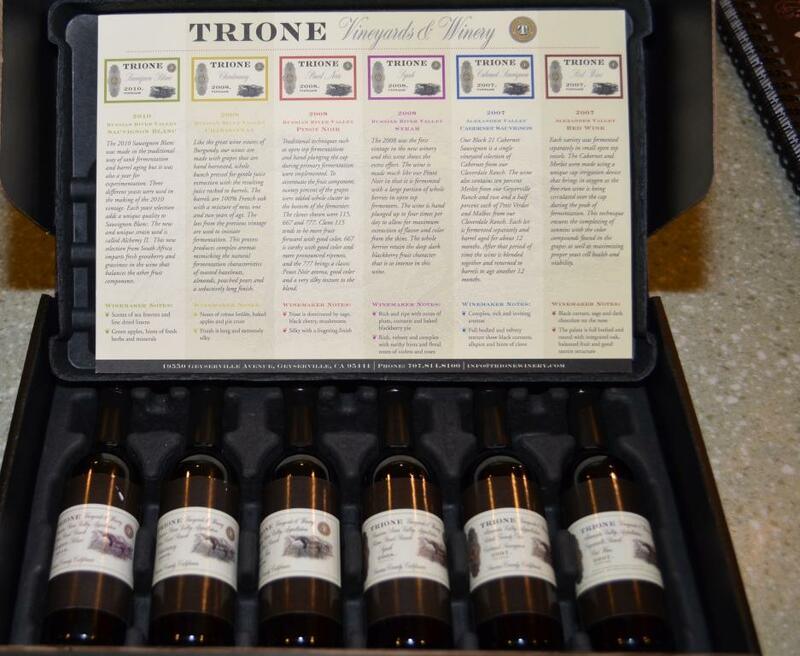 A few month ago I got an email from Trione winery offering me a gift. Not just any gift – wine. Free wine. Words “free” and “wine” put together sound almost magical for the anyone who drinks wine daily (I refuse to take the calculator out – don’t ask). But the word “free” in the email usually means danger. After careful consideration, and actually looking at the winery web site, I decided that it was not a scam or phishing attempt, so I answered that I would be happy to get a free wine. The only caveat in the follow up response was that they can only ship wine to the limited number of states. Connecticut not included (of course). But New York was. And so my friend Emil became a recipient for the wine. 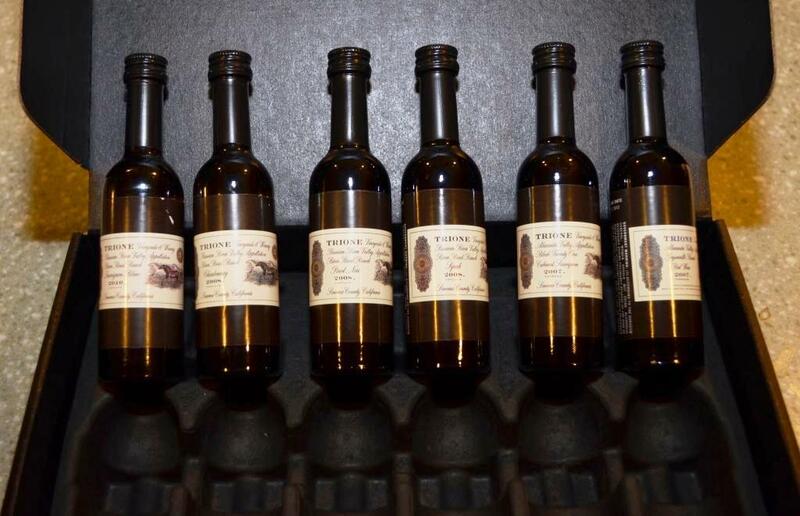 The wines are bottled in the small bottles using special technology which preserves all specifics of the wine, so it is exact same wine which will go into the regular bottles. The only exception – the wine in small bottles is not intended for aging (as you can imagine), so as the card says – drink up! And with this, let me share my tasting notes. Well, not only mine – in majority of the cases we drink wine together with my wife, especially when we are looking at the interesting and unusual experience – so I’m including her tasting notes too. 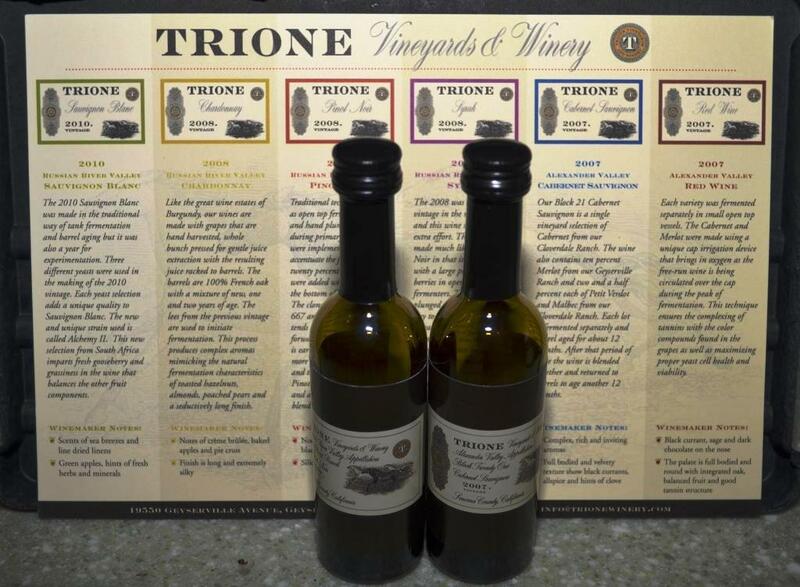 2010 Trione Russian River Valley Chardonnay(14.3% ABV) – nice butter on the nose, vanilla. Nose is very promising, but palate is not good, very acidic, no fruit, kind of flat. I’m sure it needs time or at least different serving temperature, therefore it is not rated. That concludes my special tasting report, folks. Until the next time (hopefully someone will send me good and free wine soon) – cheers! 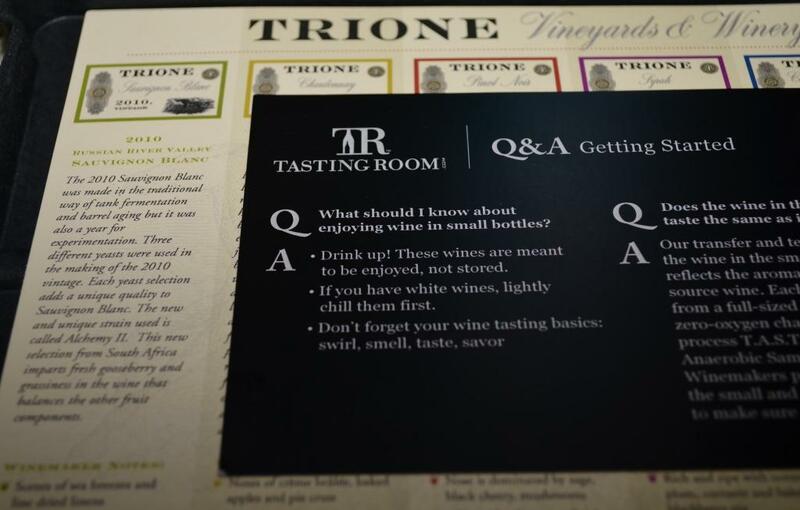 Disclaimer: the wine was provided by Trione Vineyards and Winery free of charge. All opinions are my own. As you can see, first four wines were from France, and the last one was from California. I will try to offer a higher geographic variety with the red wines quiz. Going for the interesting news, I found one article from Dr. Vino which I wanted to share with you – it is about use of the music in the vineyard – what do you think, can the music affect the vines and lead to better (or worse) wines? In a kind of “local news” update, I’m in Texas this week, where I will attend the GUSTO Tastings event, called “Texas versus the World”. GUSTO Tastings (which is effectively a meetup group) runs a lot of very interesting wine events here in Austin (lucky for you, people of Austin), and every first Wednesday of the month they conduct a special event where they compare Texas wines with the wines from other regions and countries. 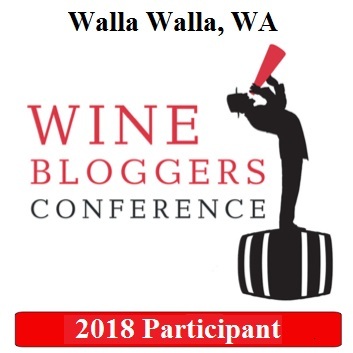 Today’s event will be all about Viognier, and I’m definitely looking forward attending it (and meeting fellow wine blogger @SAHMMelier, who told me about this event) – for all of you who will not be able to attend it, I promise the blog post with all of the details. That’s all for today’s Meritage – enjoy your Wednesday, folks, and make sure there will be wine in your glass (definitely will be in mine). Cheers! To finish off the wine reviews quiz series, today we are following the steps of the previous two wine quizzes (#29 and #30), only now going to the next level: you will need to match 5 reviews and 5 wines. Actually, that “finishing off” will separate into two separate quizzes – one for white wines and one for reds. Here are the reviews. Just to make it a bit easier, note that all the reviews are for single-grape wines. Please provide the answers in the form of A1, B2 etc. Bonus question – provide country of origin for each grape/review combination. Double bonus – in addition to country, provide more precise appellation, like Finger Lakes, Oregon, etc (doesn’t have be exact, but it should be more narrow that the whole country). Have fun, good luck and have a great weekend! Cheers! I’m not complaining – complaining is futile, as things always can be worse than they are. I’m just stating – this is not my kind of weather. I don’t like it. I don’t like this stuffed hot air, so dense that it can be cut with the knife. Don’t think cutting air with knife would be very effective. I guess there are better tools for making that hot stuffy air less noticeable. One of the best ones I know is acidity. No, I don’t mean rubbing myself all over with the slice of lemon, or drinking copious amounts of the lime juice. 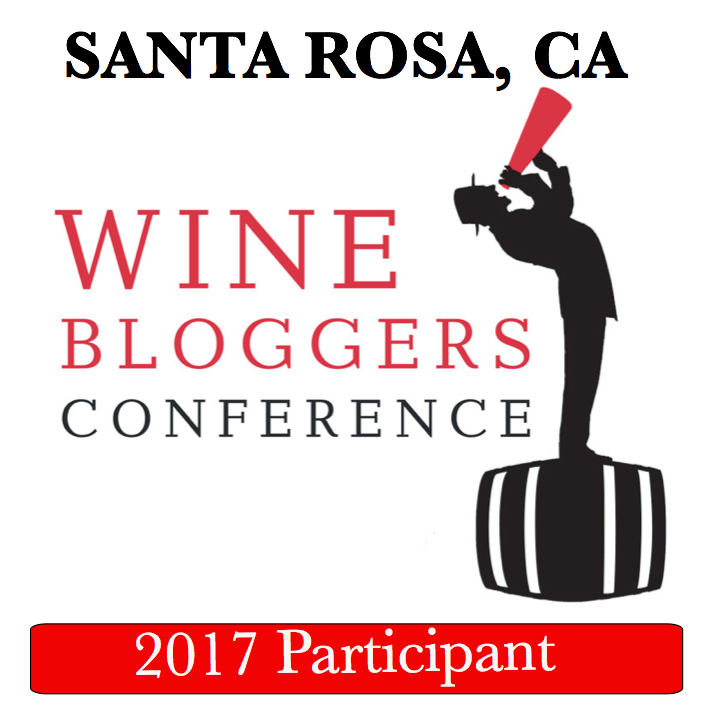 Of course I’m slowly nudging towards the main subject of this blog – wine. 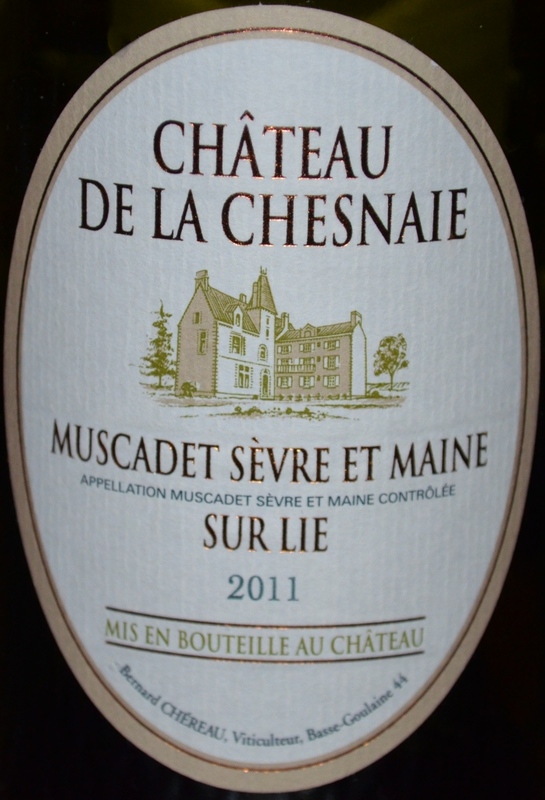 And one of the wines which possesses this refreshing, “hot-air-cutting” acidity is Muscadet from Loire.